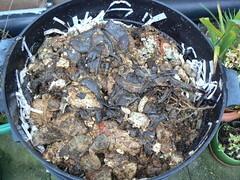 Further to the original post on 19 October 2008 here are a few pictures of the Bokashi that was added to my worm bin. 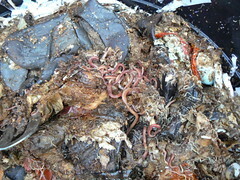 As you can see it doesn't look that much different, until you look a bit closer and see that it is riddled with worms. 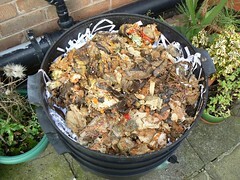 What you can't see from the picture is that the layer of waste is also thinner because they have been working their way up nicely, keeping away from the very top because of the colder weather, which has slowed the worms down considerably - you would normally expect them to have been eaten more than this but the weather has changed over the last few weeks and it is a lot colder. I might move one of the bins into the greenhouse so that I can see how much quicker the worms work in warmer conditions, but I worry about a strong sunny day getting them too hot.